Food and cooking are timeless and universal. 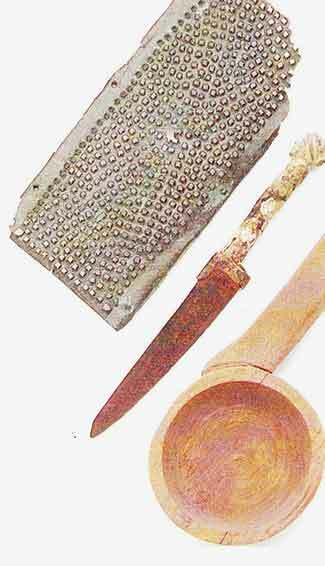 The Babylonians used the same basic equipment that can be found in modern kitchens today. Colanders and saucepans, strainers and skillets were used in Pompeii and pastry cutters were part of cooking equipment in Gaul in 200AD. From excavations in Britain we can deduce that the daily business of preparing and serving food has always been one of the main social activities of mankind. Although the modern housewife probably wouldn't find the Roman kitchen "labour-saving," she would most likely be able to use many of the Roman ingredients and utensils with little noticeable difference — we need to remember though, that she also doesn't have a number of slaves to "help" in the kitchen, like her Roman counterpart did). 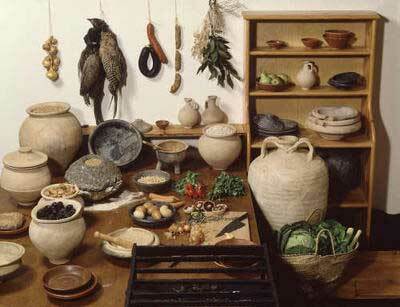 A typical kitchen in Roman Britain, circa 200AD, would have looked very similar to that shown below. The most recognizable feature is the raised hearth, a masonry construction of table height, on which was placed the charcoal, and most of the cooking was done over this Much of the cooking was done in vessels supported by iron tripods or grid irons. A fine example of a grid iron from Silchester has been copied in this reconstruction. 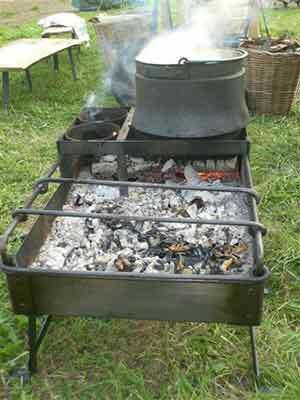 Wood was also used, as some recipes refer to certain dishes being "smoked." Arrangements for providing water for cooking and washing-up are sometimes found, and stone or wooden tables for food preparation. For baking and roasting, an oven was used. These ovens were shaped like a low beehive, and constructed of rubble and tiles. A flue, to provide a draught, would be made accessible at the front, this was all very similar to, and shows the the design of, the bread ovens which persisted for many centuries after. Charcoal or wood was burnt inside until sufficient heat had been generated; the ashes were then raked out and bread, meats or pastries put in, the opening of the oven then being covered to retain the heat during cooking. Portable ovens made of earthenware, iron, bronze and occasionally of more precious metals, have been found — some of these metal grills, called craticula, are much like a modern barbeque grill or hibachi. These craticuli presumably, were for cooking smaller items, such as leeks rolled in cabbage leaves, or pastry dishes. Ornamental water heaters for keeping dishes warm, or cooking by the "double saucepan" method have also been found. Cauldron chains such as the example displayed in the Corinium Museum were used for suspending large cooking pots over a wood fire. Large animals such as boar or venison were roasted on spits. 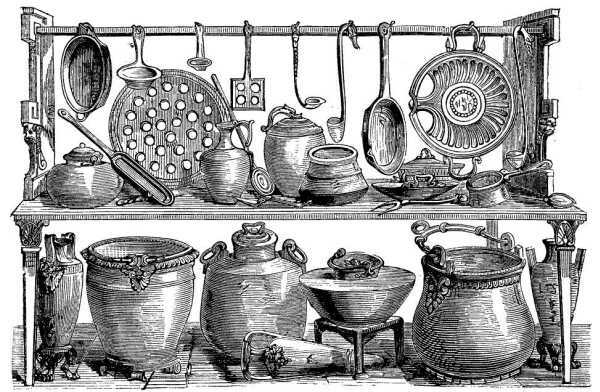 A variety of kitchen equipment was available to the serious cook. The frying pan or fretale, made of bronze, round or oval in shape, with a lip for pouring, is well known, as are rectangular iron trays with handles for roasting or frying. "Oven-to-table ware," in the form of shallow pans and earthenware dishes was common. — these are referred to as patellae and patinae. Cleaning these utensils and cookware was somewhat problematic — although metalware could be cleaned with sand, earthenware dishes and pots were quickly rendered unfit for use and thus needed constant replacement. This would account for the considerable amount of broken items found in excavations. Fortunately, local potteries would have been able to turn out plenty of cheap dishes for ordinary use. Knives of all sizes were used, made of iron, with bone, wood or bronze handles. Spoons of bronze, silver and bone have also been discovered. 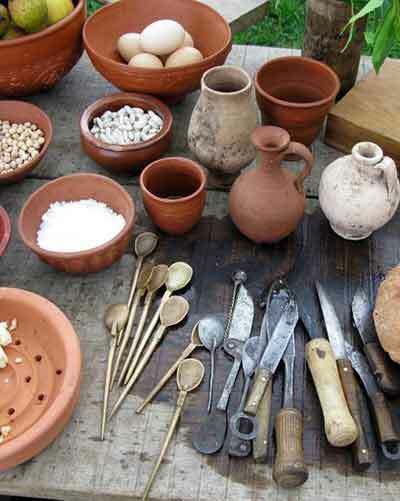 Ladles, dippers, strainers and choppers all found a place in the Roman kitchen. Mortaria were stout pottery bowls used for grinding and pounding, made with a sprinkling of grit baked into the clay to form a rough surface. Stone or wooden pestles were used with them. When the food was ready it was served on a discus, a large circular plate. 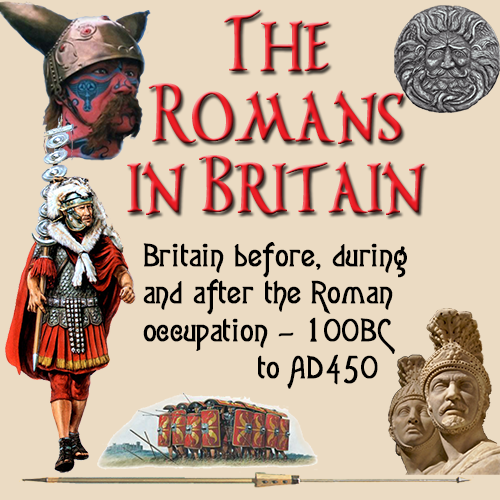 Groups of large platters of silver, bronze and pewter have been excavated, the most notable in Roman Britain being the silver collection from Mildenhall in Suffolk.